Space is limited to 40 attendees – so act now to reserve your spot. For more information, please contact MMI at events@mminst.org or (646) 868-8500. We hope to see you on December 14th. This event will be held at the offices of Voya Investment Management located at 230 Park Ave, New York, NY 10169. The following hotels are suggested options near the event. 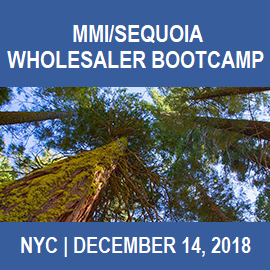 The registration fee for the Wholesaler Bootcamp is $595 per attendee. Members of the MMI Center for Distribution Excellence are eligible for a discounted fee of $495 per attendee. Contact MMI at events@mminst.org or (646) 868-8500 with questions and the Center for Distribution Excellence discount code. All cancellations are subject to a $50 cancellation fee. Full refunds minus the $50 cancellation fee will be granted for cancellation requests received prior to 5:00 PM ET on Friday, December 7th. After that time, no refunds will be granted. Your registration can be transferred to another individual at your firm without penalty. To cancel or transfer your registration, please contact MMI at 646-868-8500.